I first saw this site when I was in my group buying addiction stage. Lol. I saw it on one blog and decided to check it out. I ended up spending 4 hours browsing and of course, bidding! It's addictiiiiing. If you're into Ebay like me then you'll get what I mean. Haha. In fairness the other bidders are super competitive ha! Well, after seeing quite a number of people win Louis Vuitton bags for P100, an iPAD2 for P46 or a Canon powershot camera for P18, who wouldn't freakin' be?!! Db???? Grabeee. Upon signing in you would be given 5 free bids which you can use. Patikim lang pala yun coz after using up everything, you would want to spend talaga and buy more bids or bid packs! I should know. Heee. 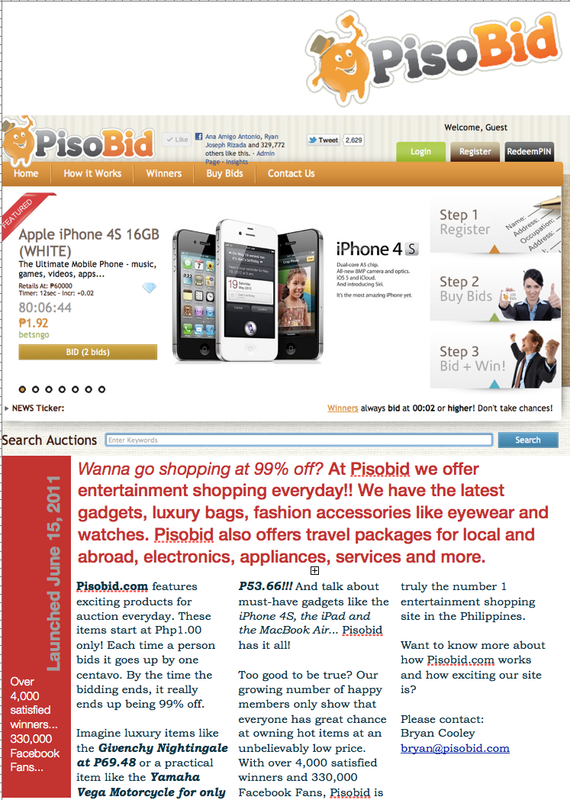 PisoBid is the #1 entertainment shopping site in the Philippines and is the country’s fastest growing website with over 10 million page views, 75 million post views and 188,000 Facebook fans. Consumers can save over 99% on brand new and luxury items such as gadgets, television sets, game consoles, designer brand items, beauty and fitness products, vacation packages and more. With its Facebook fans growing by the hundreds every day, it continues to feature incredible deals where more than 2,300 members have already won. How does the bidding go? The price of the auction item starts at 1 peso ₱1.00. For standard auctions, the price goes up by one centavo (₱0.01) for each bid. Some auctions may require 2 bids or more for each click. The second item below (iPhone 4S), for example, requires 2 bids, whereas the first one requires only 1 bid. Products to be auctioned are loaded on the main page ahead of time and the countdown timer indicates when these auctions are about to end. In the example above, auction for both items are ending in 02:34:12 (hours: minutes: seconds). When the countdown timer reaches 00:00:00, bidding officially starts and the timer will now indicate the number of seconds that bidders must place their bids for the chance to become the last bidder and thus, the winner. In the above examples, auctions are set with 10-second timers. The timer varies with each item and may have 8 seconds, 12 seconds, 15 seconds, etc. This timer resets every time a user bids to allow other members to place their bids (as compared to a traditional offline auction where the host announces: “Going Once, Going Twice… Sold!”). If you’re the last bidder when the timer runs out, and nobody else places a bid after you, you win the auction! It's not that easy to win though. You really have to stay vigilant and you need a great strategy! Ang matulog or kumain or gumimik or kumurap talo! Lol. That's all. Now, excuse me as I go buy more bids, I want that LG PRADA phone!!! ..Still getting more information about Pisobid.